This is a wall panting I did during my break between semesters. I was asked to come up with something very minimal that would go well with the angled wall and the mermaid sculpture on the left. 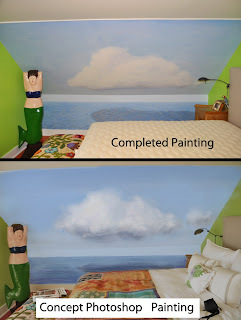 The angled wall/ceiling proved to be tough to get the right perspective for the cloud. Because of that though, it was a fun project!